Welcome to another Becoming A Modern Man! 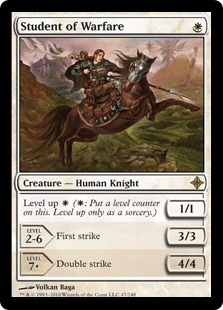 The next Magic Origins card I wanted to focus on was Kytheon, Hero of Akros, who came second in my Magic Origins poll. A one-mana 2/1 with a serious upside, I was very excited about the possibilities for Kytheon in Modern. I was working on decklists for Kytheon to fit in when the following list by John Gniadek which placed 14th at the SCG Modern Premier IQ in Washington. A classic White Weenie deck! This deck doesn't so much run on a curve as a pillar of one-drops. 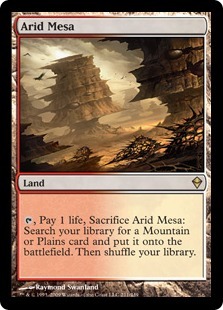 Yes, there isn't a single non-land card in the main deck that costs more than one-mana and only Dismember in the board breaks the 1-CMC rule of the deck (though inevitably you will be casting it for one-mana). So let's start by looking at the card I want to focus on. Savannah Lions with upside is kind of a theme of this deck and Kytheon is the latest addition to that group. I am happy to say that Kytheon is a good creature, a 2/1 for 1 mana is still good, even in Modern. Also, the ability to become indestructible is a useful way to keep Kytheon alive or to chump block if necessary. Flipping Kytheon is not a huge task in this deck given the plethora of one-drops. If you draw him early you should be able to set up an early flip. So how good is Gideon, Battle-Forged? I have found Gideon to be slightly odd to be honest. He is reasonably powerful but he also strikes me as being a more defensive card than offensive, which is unusual given Kytheon's focus on achieving Battalion. The +2 acts as either a distraction for their biggest creature or forces an unfavourable attack, though blocking is not this deck's forte. As such I don't find myself using this ability all that often. The +1 is more useful as untapping and giving a creature indestructible gives you a powerful defensive option and helps protect a creature from sorcery speed removal or Wrath effects. Then you have Gideon's ultimate which sees him become a 4/4 indestructible creature who cannot be dealt damage, which is Gideon's more aggressive side. 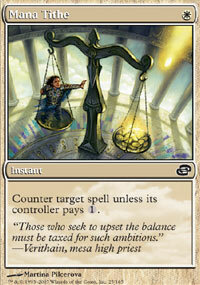 The Planeswalker element does give another angle to the deck and gives us useful protection against sweepers. 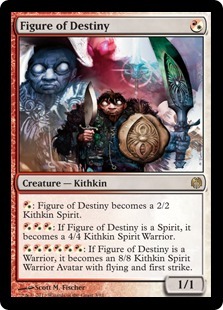 I think this is my first time ever playing with Figure of Destiny, which is a bit of a milestone. A very powerful one-drop that can become huge in the long game. It swiftly advances to being a 2/2 and a 4/4 not soon after. Figure, along with Student of Warfare, provide excellent late game mana-sinks for a deck that runs on about the lowest curve imaginable. Reaching the top end is quite difficult as 6 lands is a lot for this deck, however, I have managed it on a few occasions. Student of Warfare is another great mana sink. It quickly turns into a 3/3 First Strike and later can turn into a very serious threat as a 4/4 Double Striker. Once it has reached its highest level the Student really demands a blocker unless your opponent is willing to take 8 damage from your one-mana creature. 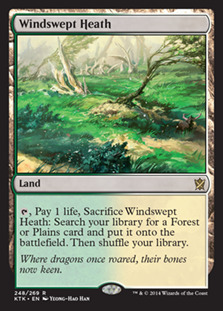 A very powerful one-drop creature but can either be the most powerful or the weakest creature in your deck depending on how many fetchlands you have. Not a great late game draw but can deal a lot of early damage, which is very important for the deck. 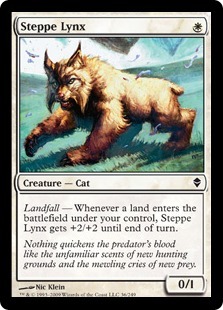 The deck runs a high human count, with only Steppe Lynx and Figure of Destiny not being humans. As such Champion of the Parish can be pretty powerful in this deck. An early Champion can grow pretty huge with the right support. 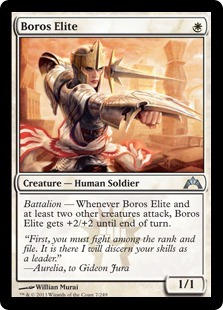 Boros Elite is the other creature in our deck that cares about attacking in groups. With a couple of comrades, Boros Elite does a nice Wild Nacatl impression. The downside is without friends he is a mere 1/1. Generally we have enough creatures to get the Battalion bonus but it's a pretty big downer when you don't. Continuing the Savannah Lions theme, we have a couple of 2/1s which upside. Solider of the Pantheon has protection from a number of relevant removal spells including Electrolyze, Terminate and Abrupt Decay. The life gain can also prove useful. Multicoloured creatures are not supremely prevalent in Modern but it can be useful on occasion. 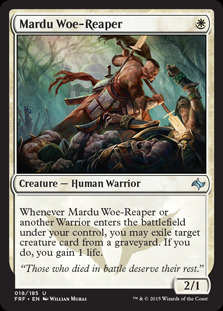 Mardu Woe-Reaper is not wholly impressive in my view. I'm not convinced that Dryad Militant wouldn't do a better job if we want to disrupt graveyards. Woe-Reaper's ability is very circumstantial, particularly as we have no way to put creatures into the graveyard short of trading or having our own creatures killed. The life gain can be relevant but it's not really substantial enough to have a huge impact on the game. Probably one of the stronger reasons to play this deck. There are better one drops in Modern than our ensemble of white weenies, however, combining the most powerful white ones means we can take maximum advantage of Brave the Elements. Brave the Elements allows us to protect our troops or can let us get through with an alpha strike. Very powerful for just one mana. One of the most powerful removal spells in the format. A cheap way to deal with the majority of the threats in the format. Path helps us clear the way for our weenies. Tithe is an interesting inclusion. Force Spike is an unusual ability for white and gives us an unusual angle of defence for the deck. In Modern, the general low curve of decks means that Tithe isn't always hugely useful, however, early on in the game (where our deck excels) it can be very useful. The manabase is very simple. 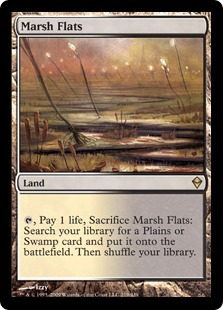 12 Fetchlands helps power up our Steppe Lynx and then it's all Plains. I would be nice to fit Mutavault in to the manabase if possible but that may require some tweaking. 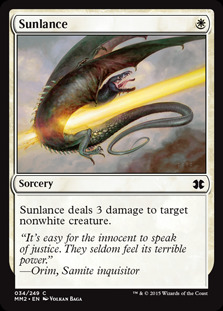 Sunlance is another nice one-mana removal spell. 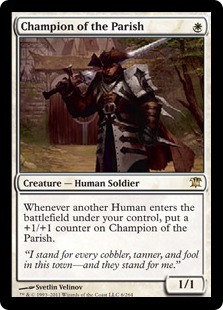 Obviously not very effective against white creatures but deals with a wide variety of common threats in the format. Dismember helps cover the rest - such as Tasigur, the Golden Fang, Gurmag Angler and Siege Rhino. Angel's Grace is not a card I've really got to grips with. I'm guessing it's a sort of Fog/Holy Day for the deck, hoping to steal a win by surprising the opponent and then hitting an alpha strike. Very good against some certain combo decks, such as Scapeshift and Ad Nauseam. 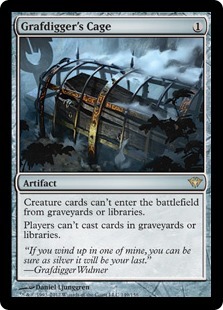 Grafdigger's Cage helps prevent graveyard shenanigans and is also an answer to Collected Company, which has become a pretty popular card in Modern. Mardu Woe-Reaper and Kytheon add extra creatures to the deck. I usually bring these in against creature light decks, where Path to Exile is not essential or in matchups where I think Mana Tithe or Brave the Elements won't be very good. A quick video deck tech for those with the benefit of flash player and who aren't too keen on that reading stuff. Our second matchup is against RG Tron. Pyroclasm can be a real problem for our deck as all our creatures are susceptible to being wiped out by it. However, in Game 1 we managed to comeback from an early Pyroclasm to take the game. Brave the Elements can also help protect us against red sweepers. Ugin, the Spirit Dragon is also an issue as it can easily wipe out our board and from there the way back is basically non-existent. However, if you can avoid these threats this matchup is pretty good due to their lack of defences to our creatures. Our second matchup is against Elf Company. This matchup seems tough. They are also capable of flooding the board and even better later as they have Collected Company and Chord to search up more threats. We can bring in Sunlance and Dismember from the board to kill off their Elvish Archdruids and Ezuri, Renegade Leader but they are often able to replace them quickly. Our third and final matchup is against Grixis Delver. I anticipated this being a difficult match and it is. They are very removal heavy which makes it difficult to maximise creatures like Boros Elite and Kytheon. 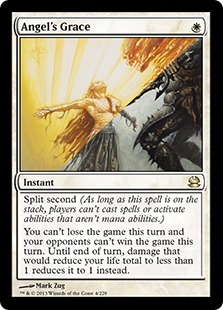 They also have powerful 2-for-1s like Electrolyze and in this match Forked Bolt. Looking at the list I was quite tempted to try out a red splash. Having access to Lightning Bolt would give the deck some extra reach. It could also give us access to Goblin Guide, Legion Loyalist or Monastery Swiftspear. 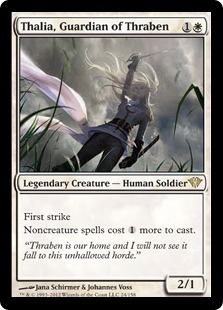 Hasty one-drops could help us flip Kytheon faster and get Boros Elite going quicker too. 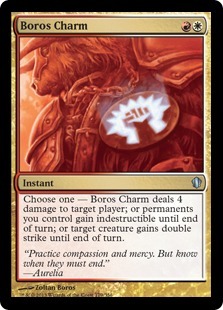 Red may also give us access to Boros Charm too, which can protect our creatures or hit the dome. This deck is certainly tougher than it looks and capable of lot more than I had expected. I had a decent amount of success against a wide range of decks and it's definitely a solid deck. I believe it was Mike Flores who said that when you are playing a deck you have to figure out why you are playing that particular deck in the metagame. The main advantage of this deck from my view is its speed. However, if we are looking for speed there are far faster decks with more reach in Modern - such as RDW, Infect and Affinity. Beyond that the main thing we get out of the deck that we can't find elsewhere is Brave the Elements. Having an all-white creature base means we can use Brave the Elements to maximum effect and it is very good at allowing an alpha strike or protecting your team. However, as great reasons to play a deck go that really isn't one. That said if you are looking for something a little different or an excuse to play Kytheon then you could certainly do a lot worse. I recommend this deck as a fun deck that allows you to use Kytheon in a cool way. It is pretty competitive and has some good matchups in the format. He breaks down his choices, discusses sideboarding, a mini-tourney report and the changes he'd make. It's a nicely written little piece and worth checking out if you're a fan of White Weenie decks in Modern. Thanks for this Gio. I hadn't realised he'd written an article. That's great thanks! I have been working on/looking for a not Soul Sisters white aggro deck in modern. This one seems pretty sweet. I already made some changes and jammed some games and really enjoy it thus far. I will either do an article of post a list once I get it tuned. Yeah, it's nice to play a traditional White Weenie deck in Modern. Look forward to your article.